What's the deal with black animals? ​Nationwide, black animals in shelters have the hardest time getting adopted. They are the first to be overlooked and the last to find families. This is probably due partly to stereotypes and superstitions, and partly because it is harder to read the expressions on their faces. But the fact is that the color of an animal's fur does not change their personality. Black Friday is our opportunity to give these special animals a better chance at finding a new home. Come in and take a look. Maybe you'll find a friend and become a lifesaver! ​Saturday brings another unique special. Shop Small Saturday is a day to support small, local businesses. 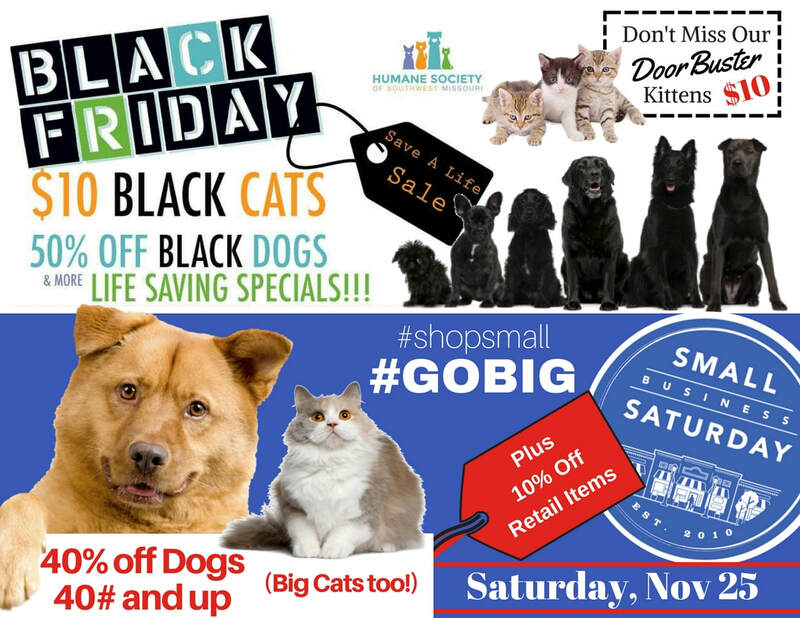 We hope you will Shop Small and Go Big with our 40% off special on larger dogs and cats! Plus, on Saturday we are also offering 10% off our already low prices at our tax-free retail shop. We hope to see you on Friday or Saturday - or both!